In the year 2099 we see two Clan Zefiro Gypsies, Wire and Xandra, trying to sell some illegally obtained data on the streets of Antikva Vilago, Latveria. The deal is broken up when a guardsmen patrol hovercraft shoots the buyer and chases Wire and Xandra out into the wilderness.<br />They seek refuge in the ruins of an old castle when they see a man, in a cloak and armored suit, suddenly appear in a flash of energy. The man speaks of being in pain and then looks around wondering what happened to his castle. That is when the guardsmen catch up to Wire and Xandra.<br />The guardsmen tell all three to stand down. The mysterious man is angry at being told what to do. He asks, Dont you know who I am?. 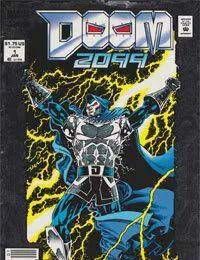 He then blasts energy from his gauntlet, destroying the guardsmen, while shouting, I am Doom!.